What is pea milk and why are people talking about it? It’s easier than ever to live a plant-based life – long gone are the days when you would be shunned from coffee shops if you asked for dairy-free milk. The vegan milk industry is booming, and whether you favour almond, oat or soy, it’s worth trying a new name on the scene: pea milk. Whole Foods predicts pea milk will be big this year, with the brand Mighty Society Pea Milk launching exclusively instore in the UK this month. Ireland might be a way away from getting its own influx of the trendy dairy alternative, its presence in the UK is almost a guarantee that it'll be hitting our shores soon. While it’s not made its way to the high street coffee chains just yet, you could very well be ordering a pea milk latte in the future – so, in preparation, here’s the low-down. Don’t worry, you’re not going to be served up bright green coffee when you order it with pea milk. Instead of the green variety that goes well with fish and chips, it’s actually made from yellow split peas. It’s not like it has a vibrant yellow hue either – made from pea proteins, it looks pretty much like cow’s milk but thicker with a beige tinge. 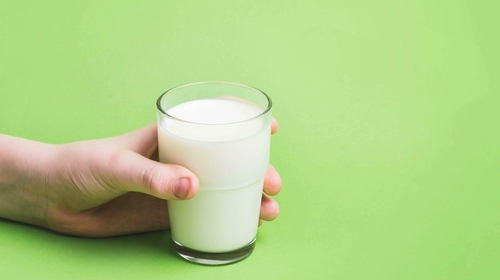 Some pea milk products have already launched in the US and people seem to love them. It’s said to taste a bit more like cow’s milk than other alternatives, and its creamy texture means it can froth better for coffee. Perhaps the best thing about pea milk is how high in protein it is. One brand popular in the States is Ripple; per 240ml serving, it contains 8g of protein. This is impressive compared to the 0.96g in Alpro almond milk, and is remarkably similar to the 8.64g in semi-skimmed cow’s milk. Unsweetened pea milk contains a similar amount of protein to cow’s milk but with less calories – 70 cals compared to 120 per serving of the semi-skimmed dairy stuff. It’s also rich in other good things your body needs like potassium, calcium, vitamin D and iron. However, as with most types of plant-based milk it’s best to opt for the unsweetened version, because otherwise it could contain a lot of hidden sugars. Hey if you’re vegan and drink almond milk, try to start drinking other options like coconut milk or pea milk. It takes a lot of water to make almond milk and it has a negative impact on the environment!! It’s widely accepted that a vegan lifestyle is kind to the planet, however there’s increasing chat about what kind of plant-based milk is best. This comes in light of the worrying statistics around almond milk, which is one of the most popular milk alternatives available. Growing almonds has a remarkably small carbon footprint, according to research published in the Journal of Industrial Ecology (and of course dairy does not) but producing almond milk may be impacting the environment in other ways. The UCSF Office of Sustainability cites research done by the New York Times which found it takes 15.3 gallons of water to grow just 16 almonds. In comparison, it takes much less water to grow yellow peas. Life Cycle Associates did an analysis of Ripple’s milk and found that "yellow peas are also water efficient, capable of achieving 30-bushel per acre yields on only 10 inches of rainfall". According to the research, it takes 100 times more water to grow a tonne of almonds compared to dry peas, and dairy milk requires 25 times more water per litre of milk compared to Ripple.